Immerse yourself in nature and the beauty of our planet with a week of yoga and whale watching in the Dominican Republic. This is a retreat for the truly adventurous yogi. 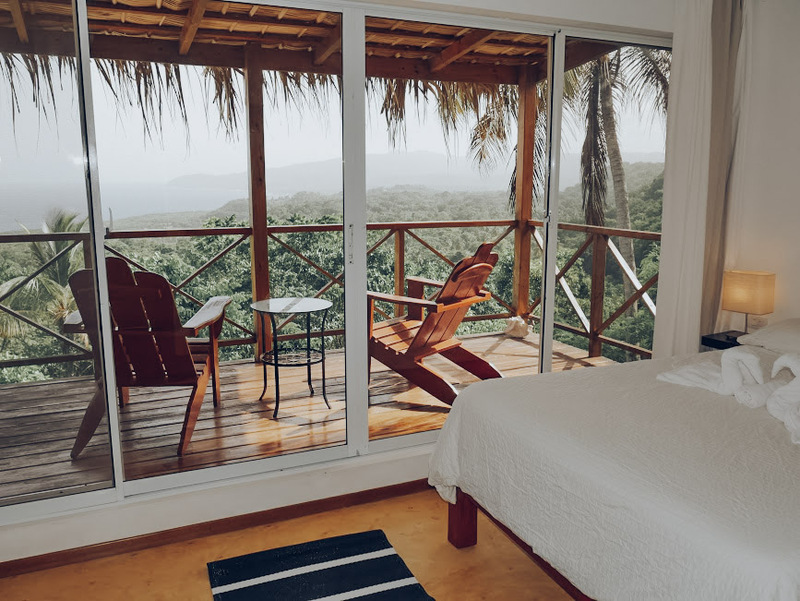 You'll wake up every morning to stunning views over jungle and ocean in a private bungalow, nestled in the private hills of Samana Bay. You'll start each day with yoga, Pranayama and meditation on the deck overlooking the ocean. You will be able to see humpback whales play from the resort, but you'll get up close and personal to these gentle giants with a special boat trip–a once in a lifetime experience! You'll ascend to the top of Salto El Limon waterfall on horseback and hike down to enjoy a refreshing swim in the big natural pool. You'll explore unspoiled coastline and luscious, rich land in a day of hiking through Boca del Diablo, Playa Frontón and the rural area around Las Galeras. You'll sample local delights and dive into the turquoise ocean just minutes away from your accommodation. Needless to say, this is an opportunity to step ou of your usual routine, soothe your soul, and invigorate your body in a lush and tropical location. After you arrive, you'll refresh yourself with a welcome drink at the resort and have some time to settle in. Then, you'll participate in an opening circle and a grounding yoga class before winding down the day with your first group dinner. You'll have a snack of tea and fresh fruit before your morning meditation and Vinyasa yoga class. Then, after a delightful and hearty brunch, you can get your welcome massage, relax by the pool, read, sunbathe, or whatever else you'd like. Fuel up with an afternoon tea and snack before heading to your restorative Yin yoga class. End the day with a hearty and wholesome group dinner. After some tea and fruit, you'll head to your morning meditation and Vinyasa yoga class, followed by a delicious brunch. Then, you'll head out for an adventure hike through the jungle to a secret paradise, where you'll eat fresh coconuts and packed snacks upon arrival. In the evening, you'll regroup with your retreat mates for a wholesome and nutritious dinner before heading to bed. Start the day with tea and fruit before heading to your morning Vinyasa yoga and meditation class. After brunch, you'll have some free time to relax, lounge by the pool, read, sunbathe, or whatever you please. Then, you'll head out for a horseback ride to the El Limon waterfall, where you'll swim in the clear, sweet water. After you return, you'll wind down with a gentle Yin yoga class and mantras before dinner. After your morning tea and fruit, you'll jump into the day with a fiery Vinyasa yoga class and meditation before heading to brunch. You'll have some free time to relax, hang by the pool, read, go to the beach, or get an optional massage before your evening Reflexology Workshop. The day will end with a delicious and healthy group dinner. After your morning fruit, tea, meditation, and Vinyasa yoga class, you'll fuel up for the day with a hearty and wholesome brunch. Then, you'll depart for a boat tour to watch the humpback whales in the bay. You'll return for tea and a snack, then regroup for Pranayama, soft stretches, and mantras before dinner. After fresh fruit and tea, you'll have one final meditation session and Vinyasa yoga class followed by brunch. Then, you'll check out and depart for Santo Domingo/airport. Beachy-chic bungalows overlooking Samana Bay. 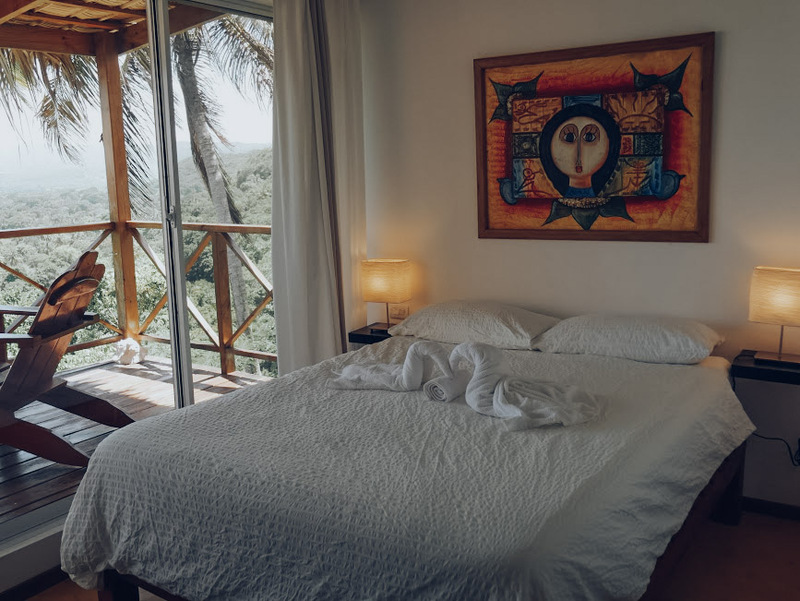 High up in the hills of Samana Bay are 13 eco bungalows with spectacular ocean views; each bungalow has a Double bed, private bathroom, fan and protective sliding doors. Half the bungalows have a private terrace attached, whilst others have a panoramic window that can be fully opened. The communal space consists of an infinity pool, lounge area, big dining space with WiFi, and gardens. The tranquility and natural surroundings of the resort will soothe your body, mind and spirit. These beautiful bungalows come with one Double bed, en-suite bathroom, and a private terrace or panoramic windows. Your very own bed in a bungalow with two twin beds, en-suite bathroom, and private terrace or panoramic windows.